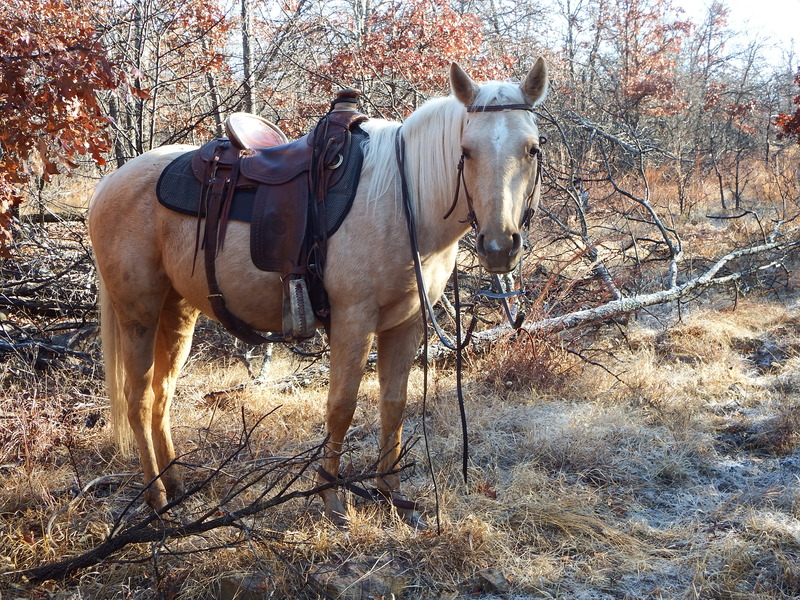 Polly is really a pretty Palomino that is technically a registered solid paint. 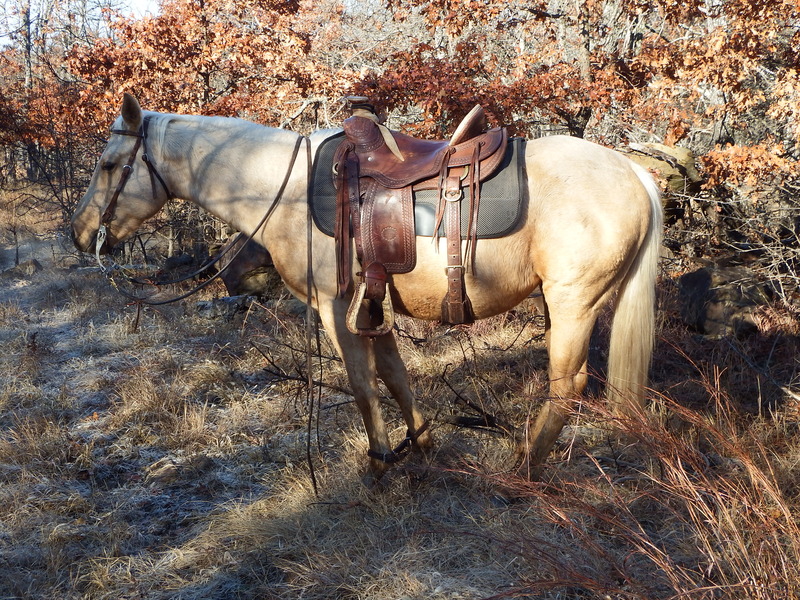 She has been ridden and used on the ranch a lot. The golden color really makes her especially attractive. She rides and handles well, but she is not a horse for a beginning rider. 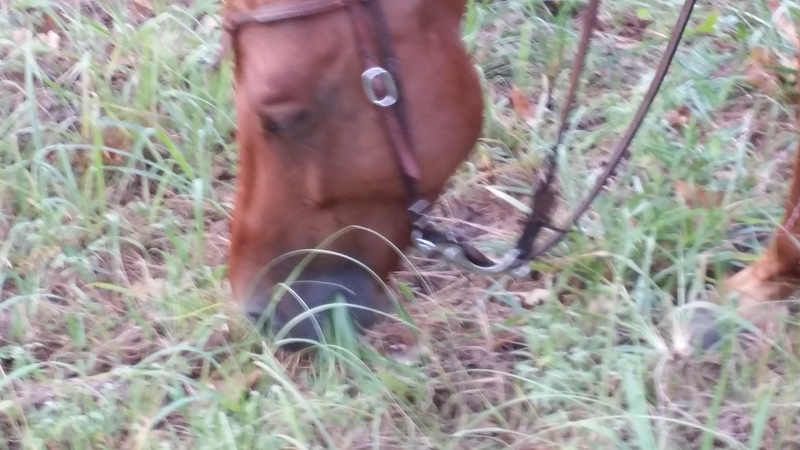 For someone looking for a young, sound horse that is easy to catch, bridle, saddle, and knows how to neck rein, lead, back, side-pass, and comfortable around livestock and other horses, Polly may be the horse for you. She has seen a lot of trails and wet blankets. If you want to know more about Polly, give Shawn a call 918-849-0004. 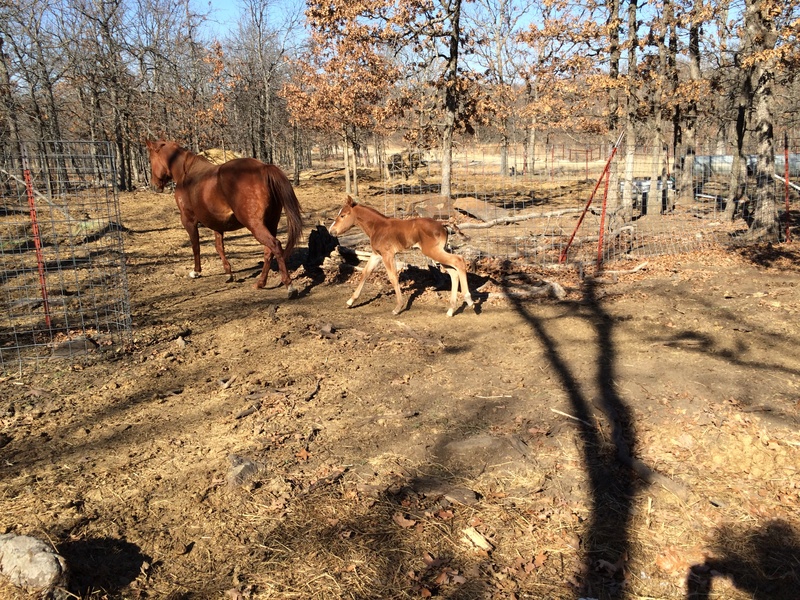 The stud colt is out of another mare we have, Suzie and Colonel, our stud. He’s full of himself and thinks he’s real big stuff. It won’t be long before he learns the world isn’t going to revolve around him, but for a few more weeks we’ll let him be in charge of the place. 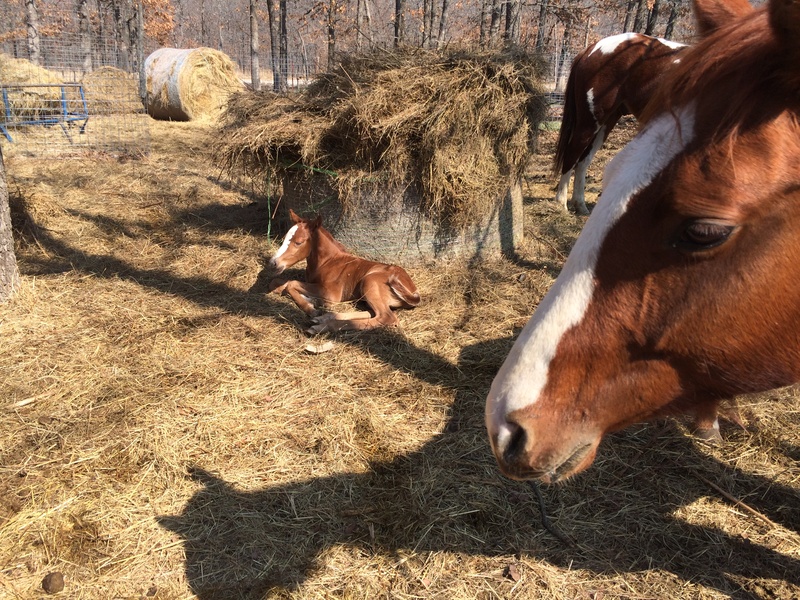 Montana’s baby with a full tummy and the warm sunshine. Life’s good! 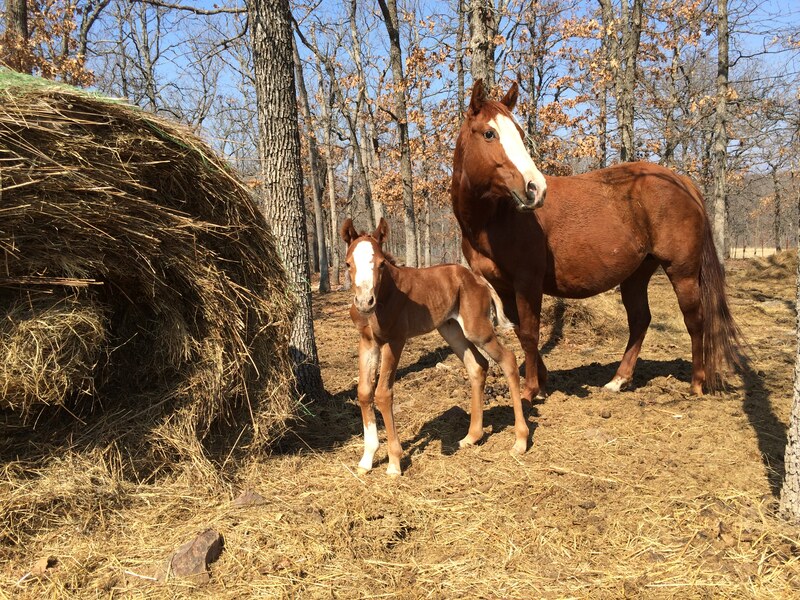 Montana’s first filly arrived. She’s a cutie! We still remember when Montana was a baby and we practiced “rock training”. We used to put flat rocks on her back to see how long she would leave them. It was a way to pester her and get her used to new concepts. The filly has the kind of mother we like. She is protective and watchful of her offspring in a paddock with five other horses, but friendly enough for us to walk up to her to check on the little one. The filly is out of our stallion, Colonel. 2. Teaches a horse to remain calm while their feet are caught in something the horse didn’t expect. 3. Gives the rider the option of overnight restraint without a fence. The photograph shows Polly standing hobbled about 10 feet from limbs being cut off the fence with a chain saw. During a recent ice storm, a lot of limbs and small trees found their way to the top of the fence. Polly was used to transport the chain saw and stood hobbled while the limbs were cut away. Horses need to learn to stand quietly in hobbles. You never know when hobbles might be needed to be used in an emergency situation. Hobbles also teach your horse patience, not to mention how to stand quietly when their feet are caught. After learning to stand with hobbles, Polly will not have any trouble learning to ground tie. She will be used to standing and waiting until her rider is ready to go. Hobble training has many benefits. It is amazing to see the number of horses that have to be plow reined. Look around and there are horses everywhere that don’t know how to neck rein. We see neck reining as a basic, foundational requirement. The video shows P.J. working on some neck reining exercises to further refine and develop the smooth, effortless turns, stops, and backing a good trail horse should have. P.J. 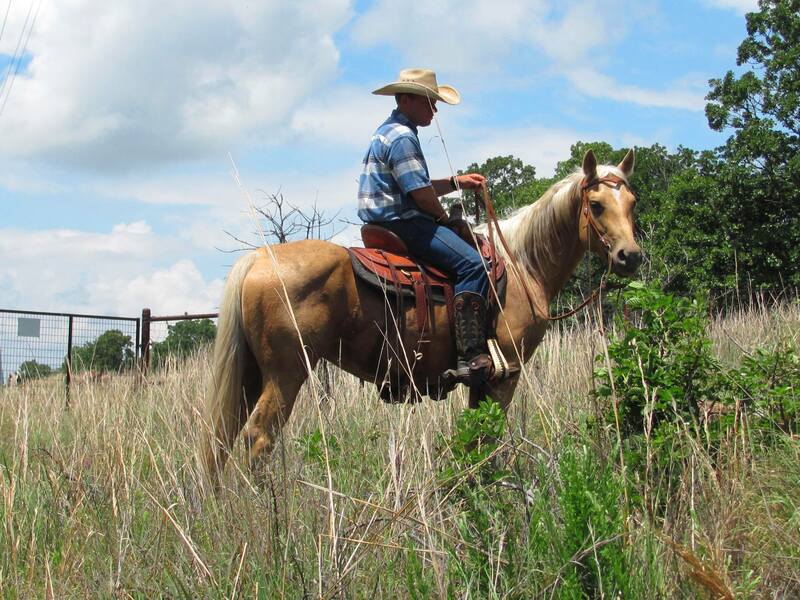 is a registered paint enrolled in our two-year trail horse training program. He has a lot of quarter horse blood in his pedigree and the disposition to make a great trail horse. Proper placement of your horse’s feet is just as important as placement of your own feet going down the stairs. Missed steps due to poorly positioned feet can cause a fall. 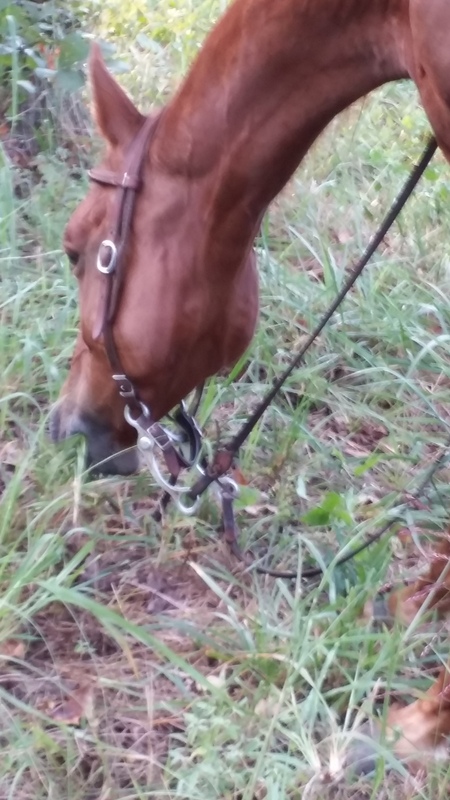 A trail horse should always know where his feet are. He needs to keep them under himself and maintain his balance while you ride. The video shows Chex, one of our registered AQHA quarter horses. Chex does a nice job of putting his feet where they need to be so you can enjoy the ride. News on 6 reports on the Rogers Co. Sheriff’s Mounted Patrol (Mounted Search and Rescue Unit “MSAR”) watching over the Christmas shoppers at the local Wal-mart in Claremore, Oklahoma. As a courtesy to the citizens, the mounted patrol members escorted shoppers to their cars and kept an eye on their vehicles so folks could come and go worry-free. Service with a smile to brighten up the holiday season! Pete had a great time and enjoyed all the kids petting his nose! The Rogers Co. Sheriff Department has certified Pete and Jack, two of our AQHA quarter horses, for the mounted search and rescue “MSAR” patrol. Both received approval for Level 1 Certification, this means they are approved to be called for any situation at any time. There are three levels for horse certification in the department. Level 1 is the highest certification available and approves the horse for all situations. Level 2 means the horse is certified for limited operations and by approval in only limited situations. Level 3 is certification to attend training events, but no field operations. Level 3 is intended for horses that have potential, but need additional training before use in a real life event. There were a number of applicants that received no certification as the horses were not qualified for the program. A separate certification is required for each volunteer to serve as a reserve officer for the MSAR operations. We are happy to announce Shawn McKibbin received his certification as a responder and serves on an “immediate” call basis. 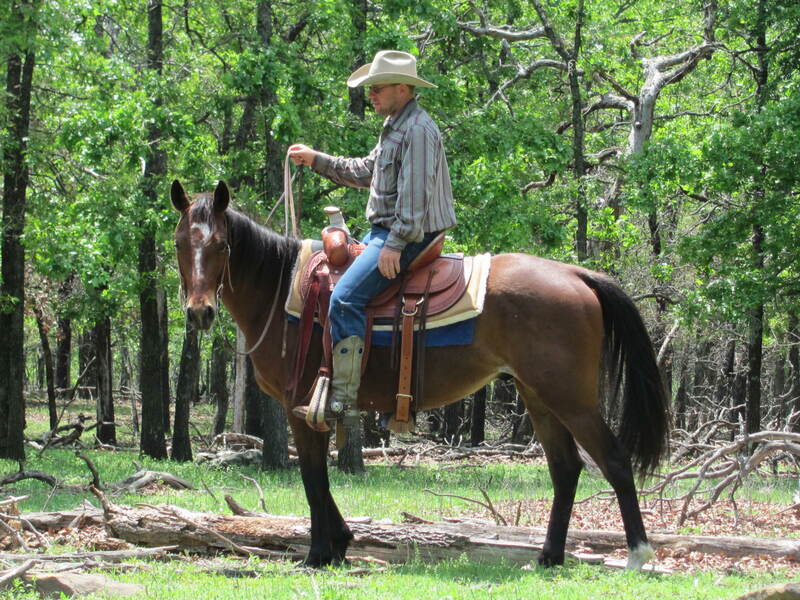 Shawn oversees the training program at Post Oak Ranch and spends a lot of his time teaching young horses the ropes. 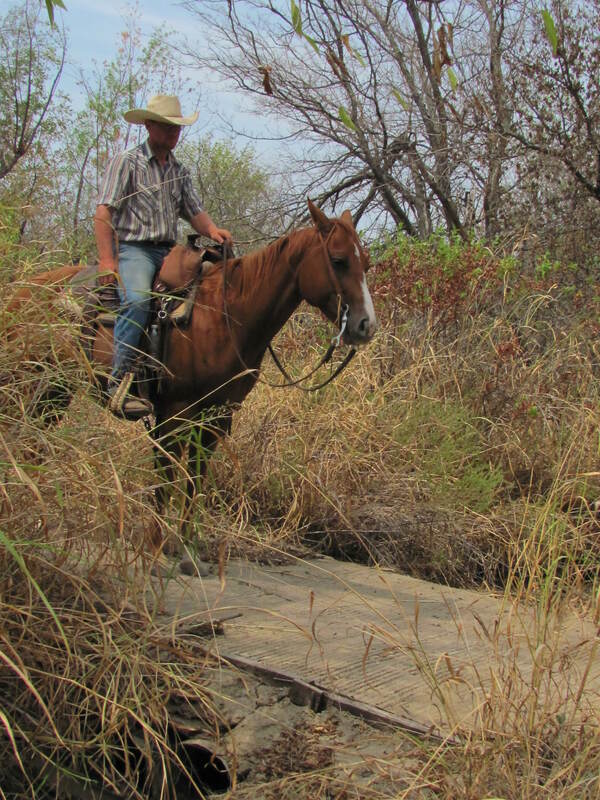 The crossover from the routine daily training to develop trustworthy trail horses to certified MSAR mounts is a natural one. Our horses must pass a number of internal tests for soundness, stamina, disposition, and ability, many of the same attributes required for search and rescue horses. We insist that our horses be “using horses” and “working animals” ready for a variety of activities including MSAR operations. Some of you will no doubt recall Jack was used in a search and rescue operation during the first year in our training program and located a lost little boy. He has keen hearing and pays attention to his surroundings. The boy was heard by Jack over the noise of helicopters, 4-wheelers, and a full-scale search and rescue operation. He alerted Shawn who had been requested to assist by local law enforcement. When Jack became interested in something that could be neither seen nor heard with human senses, Shawn turned the direction of Jack’s focus to investigate further. The little boy was found a short while later resulting in some greatly relieved parents. Congratulations to Shawn for qualifying the horses and himself! He will be a real asset to the Sheriff’s mounted patrol posse! You are currently browsing the archives for the Our Horses In Training category.